Alongside this morning's launch of Symbaloo in the US, I prepared a list of 50 top startups that I am watching. Challenged to rank the 50 from one to fifty in terms of both interest and viability, it proved to be a challenging task, but I can make a good case for all included, as well as their position. Of course, no list is without its omissions and second guesses. I am sure that if I ran this exercise 10 times, I would get a different list 10 times. With the understanding that being a private company does not always mean you are a startup, I looked below the uber-players such as Twitter, Facebook, LinkedIn, Groupon, Craigslist, Tesla, and others, with a focus primarily on Web services, with a tendency toward social, and apps I am using frequently. I am more than happy to share with you the list, and it would be great to hear those you think I left off the list and missed, or how this is off base. 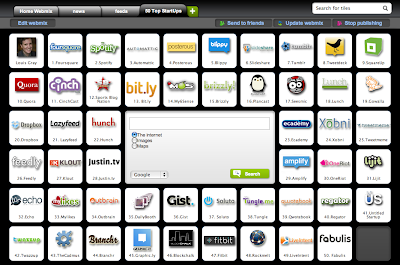 Thanks to Symbaloo being out there, I hope to keep similar lists updated on my Webmix. Disclosures: Symbaloo and my6sense are clients of Paladin Advisors Group, where I am managing director of new media. In addition, I am an advisor to MyLikes and have previously done work with Ecademy.